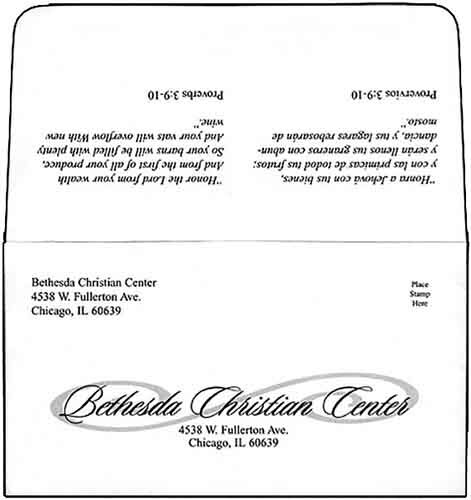 Custom printed, white offering envelopes. Double sided printing with black ink on 4 panels (top and bottom panel of the inside and outside). 1 colored ink (in place of black) available at an additional cost of $30.00. Envelopes measure 6 1/2 inches x 3 5/8 inches, closed, and features a long, 3 1/2 inch flap for personal information, such as credit card information, that is hidden when the envelope is sealed. Pricing includes printing, white envelopes per thousand and basic setup from properly supplied files. These envelopes are mailable and come to you shipped unfolded. Minimum order of 1000. Note: The picture shown is only a sample. You must supply the information you want printed. Envelope art must fit the 2136ds Remittance Envelope template. 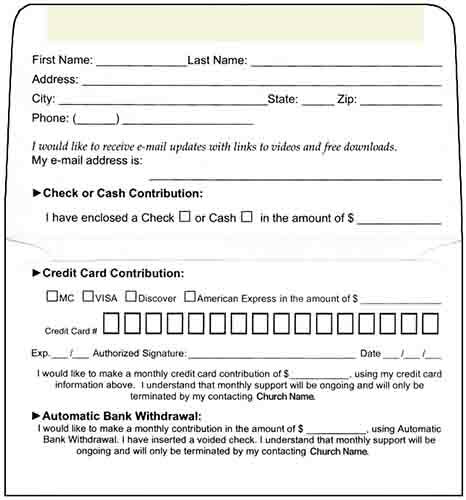 If you do not have a designer that can use our template and provide a print ready file, we can create the envelope for you at a additional $60.00 per hour. If you would like to use the pictured example layout, edited with your information, there is a $30.00 art charge.